The anti-illegal drugs campaign in the city of Baybay focus on saving the user and putting the pusher in jail. And for the last 11 years, 67 pushers and users have been apprehended and filed with corresponding cases at the Regional Trial Court, Eight Judicial Region, Branch 14 in Baybay City, Leyte. Based on available records, five (5) of these cases were dismissed due to lack of sufficient evidence to establish probable cause of the offense charged, while one (1) case was dismissed due to lack of legal jurisdiction. This was revealed by PSUPT RAMIL N. AMODIA, Chief of Police of the Baybay City Police Station during the Kick-off Ceremony of the 2016 Drug Prevention and Control Week, on November 14, 2016, which was held at the Baybay City Gym. And as a popular saying goes, “Knowledge is power”, the Police Community Relations Office and the City Anti-Drug Abuse Council (CADAC) joint forces in the conduct of Information, Education and Campaign (IEC) activities among the different sectors of the society. During the “Drugs Symposium”, the Salient Features of the Comprehensive Dangerous Drugs Act of 2002 (RA 9165), the reasons why people turn to illegal drugs, the ill effects of drugs, the fines and penalties, and how each could help stop illegal drugs were discussed. When President Rodrigo Duterte mandated the Philippine National Police (PNP) to implement PROJECT “TOKHANG”, 2,252 drug victims voluntarily surrendered themselves to the Baybay City Police Station and were categorized as users and pushers. Among the users, 6 are female minors, 133 are male minors, 60 are female adults and 2,041 are male adults. Among the pushers, on the other hand, the men (11) outnumbered the women (1). The City Mayor, Hon. Carmen L. Cari, immediately called for a meeting on how to handle the surrenderees. The former Chief of Police, PSUPT CARLITO DE GUZMAN GALLARDO, suggested to conduct a physical activity thus, the first taebo exercise with the surrenderees was held on July 19, 2016 at the Veteran’s Plaza. This activity is being sustained by the Baybay City Police Station and is done every Saturday in the morning. A week after, Dr. Norberto Oja, Medical Officer of the City Health Office (CHO) in Baybay City, revealed that in a meeting called by the Department of Heath Regional Office 8, the latter revealed that all cities and capital towns in the country are mandated to establish a Day-time Therapeutic Community Center to accommodate the need to provide immediate interventions to the escalating number of drug surrenderees. And with the able leadership of Dr. Oja, 585 drug dependents had already been assessed, with whom 96 turned out to belong to the high-risk category and needs immediate intervention. 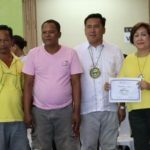 Thus, City Social Welfare and Development (CSWD) Officer Loreta Malabanan and Dr. Oja asked for the permission of Congressman Jose Carlos Cari of the 5th District of Leyte to use the newly-constructed Library of the City of Baybay for the purpose, for a period of six months, and the latter responded positively. Ms. Malabanan and Dr. Oja presented the proposal to the Sangguniang Panlungsod, headed by the City Vice Mayor Michael L. Cari, for approval and for fund allocation. The proposal was also approved by the City Mayor, Hon. Carmen L. Cari. Ten (10) CHO and CSWDO personnel were immediately sent to the SALAG (Saving Lives at a Common Ground) Rehabilitation Center in Dulag, Leyte for immersion while the City Engineering Office and the General Services Office personnel converted the New Baybay City Library into the Baybay City Day-time Therapeutic Community Center. Finally, on November 14, 2016, the Baybay City Day-time Therapeutic Community Center was launched but the therapy of the twenty-one (21) residents started on November 21, 2016. In his message, on the other hand, Dr. Oja said that the greatest challenge of these residents, when they graduate from the day-time therapeutic community center, is that they will then become Resource Persons for the other drug dependents who had second thoughts of enrolling with the therapeutic center. You’re so awesome! I do not think I’ve truly read through anything like this before. So good to discover somebody with a few genuine thoughts on this subject. Really.. thank you for starting this up. This website is one thing that is needed on the internet, someone with a bit of originality! Thanks for the marvelous posting! I certainly enjoyed reading it, you happen to be a great author.I will be sure to bookmark your blog and will often come back in the foreseeable future. I want to encourage continue your great job, have a nice morning! Hi, this weekend is fastidious designed for me, as this point in time i am reading this impressive informative article here at my house.